Due to all the hype surrounding this novel, I started it with extremely high expectations…and found myself disappointing. It is a good book but not entirely what I expected. The book starts of with Finch and Violet meeting on the bell tower at school and “saving” each other. This scene just felt really unnatural and forced – I felt like the characters were being manipulated to behave a certain way…And the scene also seemed unnecessarily dragged out. But there were many scenes in this novel that I really enjoyed reading. The one where Finch invites Violet to go wander around Indiana with him was without a doubt one of them. That scene among others is so beautifully written. I also really loved reading the facebook messages exchanged between the two of them as well. The quotes taken from other books were also perfectly integrated. At first I found the writing style jarring because there was so much more “telling than showing.” The lack of plot was starting to get to me too…Then the romance happened! The chemistry between Violet and Finch was amazing and the story immediately started engaging me again. At this point, I really fell in love with the book…The writing seemed incredibly raw and for a book that dealt with depression, suicide and the death of a loved one – it was anything but depressing. 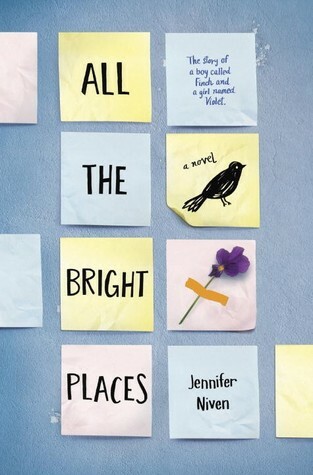 Of-course the characters endure pain and anguish but at the same time – There are so many moments throughout the book where Finch and Violet find happiness in the smallest things around them….and it just re-opened my eyes o the world around me. I felt rejuvenated and emboldened and best of all, Violet inspired me to get back to writing again. Finch and Violet – the two main characters are really complex, interesting characters. They’re fully developed but their personality and behavior – mainly Finch’s, are really capricious. Finch is rather enigmatic and you can never anticipate what he’ll do next. He’s known as the “Freak” and he is a depressed careless maniac who spends every spare minute contemplating suicide. Violet blames herself because her sister died in a car accident. And both Violet and Finch are plagued by nightmares. As the book developed, more of Violet’s and Finch’s backstories were revealed and I grew to like them more and more. The truth is that despite my discoveries about Finch, I found it hard to truly understand him. I appreciated his wild alive spark and eventually I also fell in love with him. Everything about him seemed really contradictory and I loved how he seemed to try on different variations of himself for size: “All American Finch. British Finch. 80’s Finch.” Yet this just made it harder to get to know the “real him” since he spent so much time being someone else. He kept molding his identity and personality to fit his mood and that was confusing. I personally felt like, Violet wasn’t as interesting as Finch but when she was with him, she became really spontaneous and fun. I also loved reading her planning for the webzine and later when I googled the website, it was pleasant surprise to discover it actually exists! Do I Recommend It? Yes. At first, I wasn’t quite sure I liked this book but halfway through I just fell in love with it – and I think you will too. Your review was very interesting. I really liked this book because I suffer from the same conditions as Theodore, so I felt I could relate completely. But I understand how those who may not have had that experience might be frustrated that this book focussed more on emotions and internal struggles than actual physical struggles. Usually, I don’t like emotion-based books either – say, romance books. It bores me. But this was different as I had first-hand experience and sadly many friends who have similar problems. I haven’t come across a book that deals with mental breakdowns in the way Finch suffers it. It was actually quite scary how spot on Jennifer Niven got it. Some of the passages I couldn’t have put better myself if I was talking about me. Anyway. Glad you liked it, and looking forward to reading your next review! Maybe the author knew someone who experienced those things? Well I thought the book must be accurate but I didn’t realize just how accurate it is. By the way, thanks so much for all the comments. I haven’t been feeling as motivated to write reviews lately and you engaging with my posts like this really means a lot to me.